1/ Yesterday, after the closest Senate vote in 137 years, Brett Kavanaugh was confirmed as an Associate Justice on the United States Supreme Court. Ashley Kavanaugh's body language during her husband's swearing-in ceremony is worthy of scrutiny. 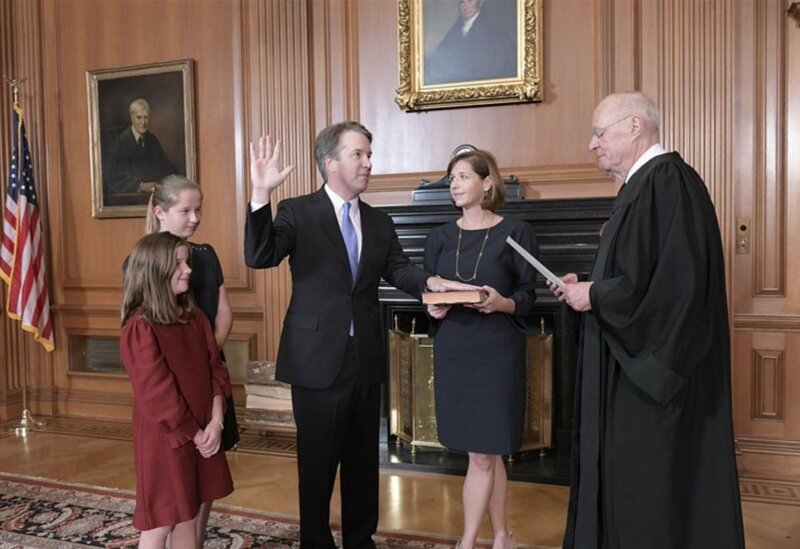 2/ Note in the above image, as retired Justice Anthony Kennedy administers the Judicial Oath to Brett Kavanaugh, Ashley Kavanaugh is standing with her left leg crossed in front of her right leg. This nonverbal display indicates a lowered confidence level & a beta emotional tone. 1/ In a meeting many thought would never happen, Donald Trump and Kim Jong-un made history in Singapore on Tuesday. What follows is a nonverbal analysis of their initial handshake. 2/ In this first moment leading up to their handshake, Donald Trump is the first to extend his hand as he is walking toward Kim Jong-un. This is a good body language tactic - for it projects initiative, strength, and an overall alpha-tone. #Portfolios carry innate positioning. Corrections are when positioning counts. #Positioning depend on your style. #Value plays out distinctly. #Momentum has its own stamp. #Thematic plays to its own dynamics. Often, we follow a blend. Often, #Portfolios are constructed without a blend. They will be distinctly #Momentum. Or uniquely #Value. Or totally #Thematic . Such portfolios may show beta that can shock and awe both ways. Market context is dynamic. Interest rates, exchange rates, oil prices, political churn & technological change are all key drivers. 1/ Yesterday, President Trump held a cabinet meeting prior to the US House vote on the tax bill. Many have inquired as to the significance of the President crossing his arms during the meeting. 2/ Over the past several months, Donald Trump has crossed his arms with increasing duration and frequency. To put this in historical-behavioral context, you'd be hard-pressed to find a single photo of any past US president crossing their arms during public events or meetings.